Peter Kettle is at the start of his career and is just beginning to make waves. An emerging talent, Peter creates paintings by immersing himself in landscape. By taking planned journeys around his native Wales, he will explore the remotest regions with his sketchbook, recording colour, texture and weather elements. 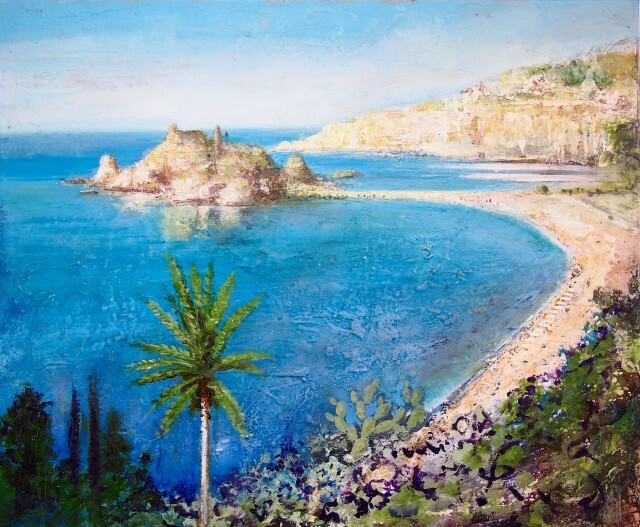 Back in his studio he will work these studies up into ambitiously scaled, expressive landscape paintings, using paint and other media poured, rubbed and splashed onto the canvas. Having worked exclusively in oils, his technique has broadened to incorporate the use of plaster with oil giving his paintings the impression of well-worn exterior walls, buffeted and corroded over time. The effect is a characterful, well weathered surface, stony and granular that is at the same time luminous with dramatic light. His paintings go through a number of stages, with Peter taking his canvases outdoors during the process, allowing wind weather elements to batter the surface, creating unpredictable patterns and texture. Peter Kettle began his career in a studio in a freezing converted cow shed, just outside Cardiff. He has recently relocated to a studio in Bristol, maintaining his travels to his native Wales, which remains a continual spur for his work. He was voted in as an elected Fellow of the Royal Society of Arts (FRSA) and the Royal Cambrian Academy (RCA) and has exhibited in Bath, Bristol, Oxford and Wales.